Playing board games and cozying up next to the fire with a good book are great ways to get through winter, but even those cold-day standbys get old. Yes, there is such a thing as too much Monopoly. Like other great Canadian communities, however, Brampton has a lot going on in the winter, with plenty of ways for you and your family to get out of the house for some fun and exercise. Here are 7 family friendly things to do in Brampton this winter! Get your sweat on at the Caledon Ski Club. Hit the slopes for some afternoon skiing and then explore the latest automotive offering from the Policaro Automotive family. 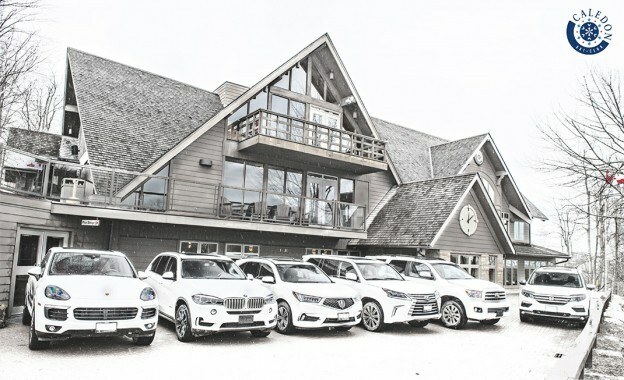 Policaro Automotive has partnered with the Caledon Ski Club to bring its performance brand to life through a series of winter events including test drives of the latest models from Northwest Lexus, Policaro BMW and Porsche Centre Oakville, a high-performance ski-service centre, and scavenger hunts for those still too young to get behind the wheel. For more information, call the Caledon Ski Club at 519-927-5221 ext. 225. Go for a bounce at Aerosports Trampoline Park. From a toddler zone to ultimate dodgeball to open bouncing, the 18,000-square-foot trampoline park at Aerosports has jumping options for the whole family. It’s the perfect spot to host a birthday party or spend any old super-cold Sunday afternoon. #SundayFunday! Kids will never get enough of jumping!!! Show off your Olympic-like skills on the Chinguacousy Park​ skating ribbon. Brampton’s latest ice worthy of your blades? The all-new skating canal at Chinguacousy Park​. The trail is more than 2,000-square-metres of ice surface, which means 500 skaters can be gliding along at once, and on certain days, local food trucks will ensure you stay fueled. Don’t have skates? You can rent a pair Thursday through Sunday during operational hours. Grab ice-side seats and cheer on the Brampton Beast. There’s no need to make the trek into Toronto to watch the Leafs when you can catch a Brampton Beast game closer to home. The local ECHL team puts on a powerful show and tickets for most home games can be easily found online. Take the afternoon off for tubing at Mount Chinguacousy. While Mount Chinguacousy offers skiing and snowboarding, the real fun is had over on the tubing terrain. Prices vary depending on use, but $13.35 will get you six slides or two hours in the park. If you have extra littles, note that the minimum height requirement to ride is 42-inches. Get suited up in armour and shoot nerf guns at Battle Archery. Sometimes the only way to sap your kids’ seemingly endless energy is to let them run it out. At Battle Archery, an indoor nerf gun playing field, they run and jump and scream all while shooting each other and other players with nerf bullets. You can play, too. Or you can sit it out and enjoy a moment of peace from the sidelines. Stoke your inner Picasso at the Peel Art Gallery. For indoorsy folk, head over to the Peel Art Gallery Museum and Archives (PAMA) and experience a variety of creative exhibitions, including one of the latest, Peel Through the Photographers’ Lens. Don’t miss the Family Fun Day each Saturday and Sunday at 1pm for various organized activities.